Trackbars are very useful in lots of occasions. It enables users to change various parameters while the OpenCV application is running. Whenever you change the position of a trackbar, the value of an integer variable is changed. Using that value, we can change a property of an image or a video. The following example will show you how to do it with OpenCV. 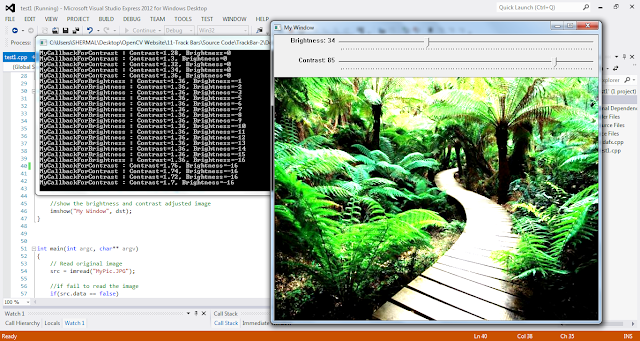 In the following example, I have added two trackbars to change the brightness and contrast of an image. It is iterating in a infinite while loop and applying the brightness and contrast to the image periodically because I want to apply the changes to the image whenever the user changes the position of the trackbar. You can download this OpenCV visual c++ example from here. count - The maximum value of the trackbar. The minimum value is always zero. onChange - This function will be called everytime the position of the trackbar is changed. The prototype of this function should be "FunctionName(int, void*)". The "int" value is the value associate with the position of the trackbar. And "void*" is any pointer value which you pass as the "userdata" (See the next parameter). which have the all the other OpenCV functions in the above example code. In the above example, I have used only 4 parameters for the "createTrackbar" function. But there are 2 more parameters. Here I am going to explain, how to use a callback function using the 5th and 6th parameters of "createTrackbar". The advantage of using the callback function is that it is not required to iterate in a while loop periodically as in the above example. In the following OpenCV example, I have added two trackbars to change the brightness and contrast of an image. And a callback function is implemented for each trackbar. You can download this OpenCV visual c++ project from here. I have used 2 callback functions; "MyCallbackForBrightness(int, void*)" for the "Brightness" trackbar and "MyCallbackForContrast(int, void*)"for the "Contrast" trackbar. I have used a global variables, src because it should be accessed from all the 3 methods. Examine closely the 5th and 6th parameters of "createTrackbar" method in the "main" method. I have added more than 2 trackbars in the following tutorial.